Welcome to my first installment of thoughtful toys. I wanted to do a few articles on toys that may not be commonly known that I think are great creative tools. Of course we know about great things like lego, but there are other interesting builder toys out there worth learning about. 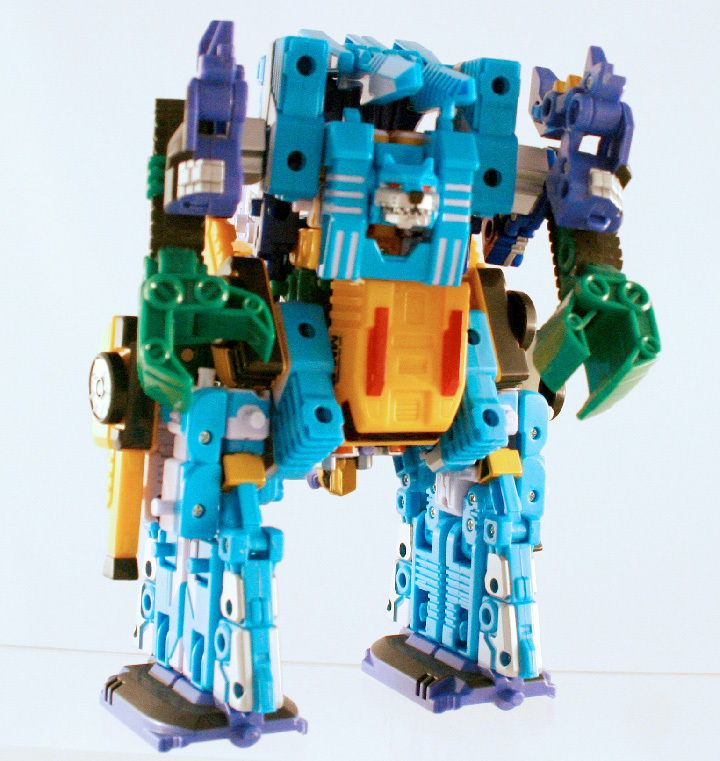 Here is Machine Robo Mugenbine. Machine Robo is a popular Japanese series you may have never heard of. A series with somewhat humble roots. Machine robo was the Japanese origin of the Gobots, which continues till today. Its a shame they did not voice dub their Machine Robo Anime for the western auidiance instead of the Gobots cartoon. 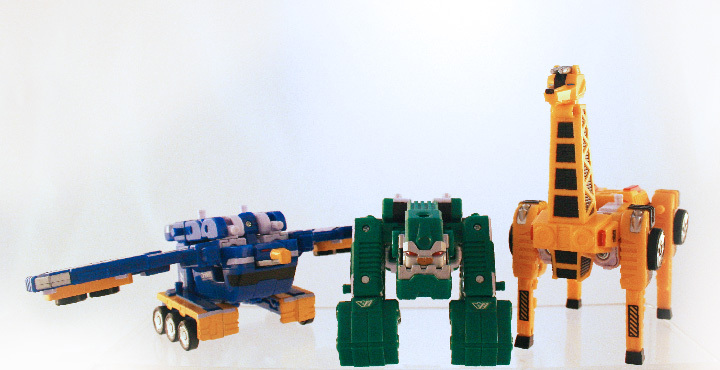 The toys might had been able to put up a better fight with the Transformers and still be here today if they had. 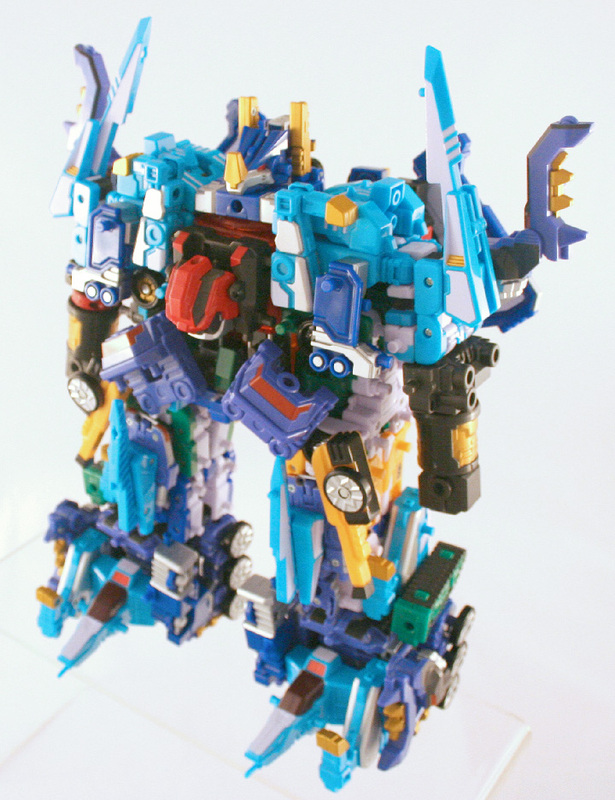 I first heard of MRM while browsing the HLJ catalogs in 2003. I thought their ascetics were sort of neat but I was not collecting this type of thing at the time, and I had no idea of their potential. It was not until seeing them in web forums in the late 2000s, long after they ceased production that I got to see what they could do. What got me into them was their later evolution, which was smaller candy toys. I will cover these in another post. Since they no longer make the MRM figures I had to track them down used. There are still some new old stock around, but the prices have jumped quite a bit. The first figures I got were Build Giraffe, Carry Eagle, and Dig Kong. 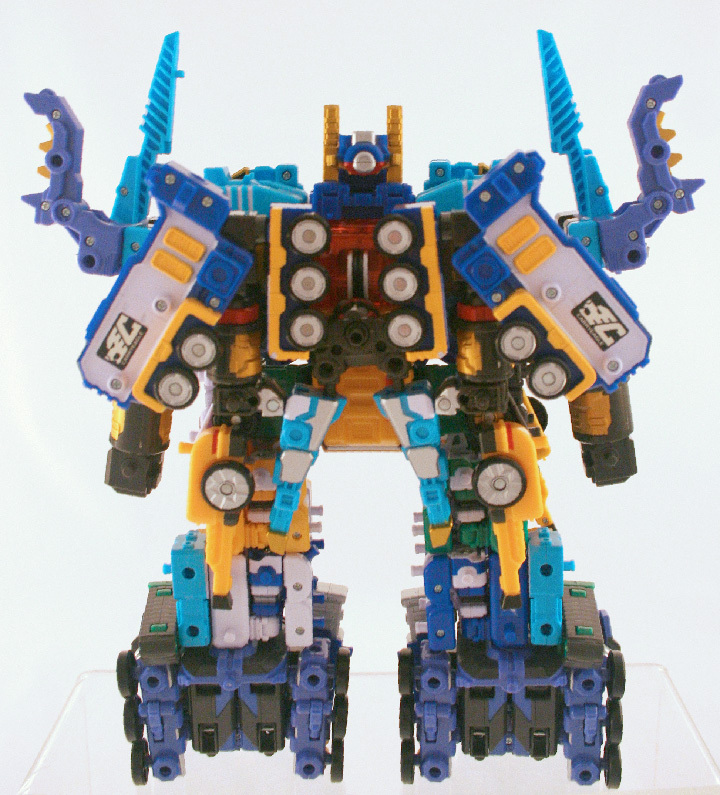 The feature of Mugenbine is that they all have a core robot and extra parts that snap on, creating various configurations. 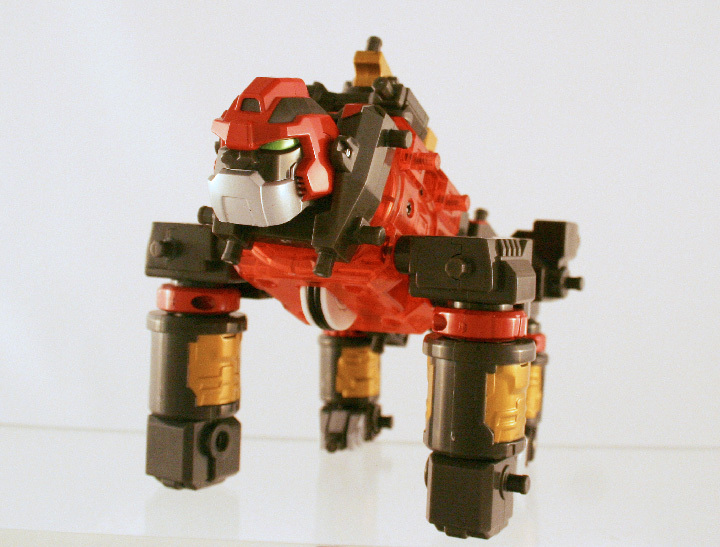 They are designed with a standard animal and vehicle mode. 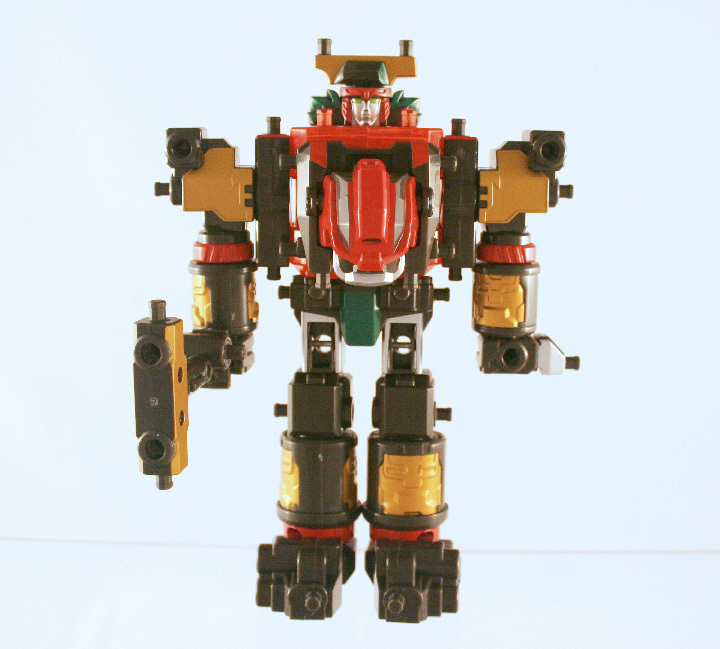 Some have special robot modes as well as combined modes with other Mugenbine. When I first got these I was excited to make something with them. The problem was the Build Giraffe was not a very good starter figure due to its limited combinations so that left me with few parts to make anything of interest. My first Mugenbine. Carry Eagle 03, Dig Kong 04, Build Giraffe 02. 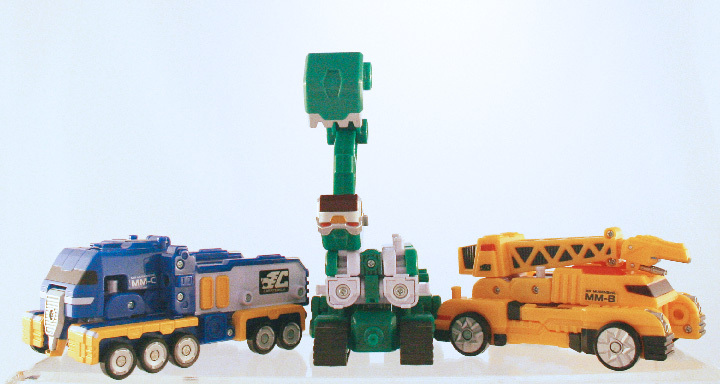 They form a truck, excavator, and crane. I wanted to combine them when I got them. They are not meant to work with the candy toys but I made it sort of work, left. On the right I was able to create some sort of four legged flying monkey beast. While searching forums like robotjapan, or ebay I was able to find some Mugenbiners who would be clearing out their collection. Since I was a little unsure about what I could do with some of these sets I was a bit stingy about buying what I came across. I passed many up but did mange to add some to my collection that helped make some more interesting bots. One thing I learned about collecting MRM is that you should get doubles when you can. They allows for more more symmetry in your designs at least in the manner you are able to make connections for things like arms and legs. Fang Tiger 06, Stag Beetle 10, Heat Tricera 08. They form a Bulldozer, Jet, and Locomotive. With what I had I wanted to build a humanoid type of robot, and this is what I came up with. There is not a lot of poseability but you can make some neat display pieces. I then wanted to take my left over parts and see what I could come up with them. This is the beast I was able to create. It was a long while until I pulled the trigger on any new MRM. I looked at a lot of designs and tried to find ones that helped in making limbs. I then got Guard Kong. 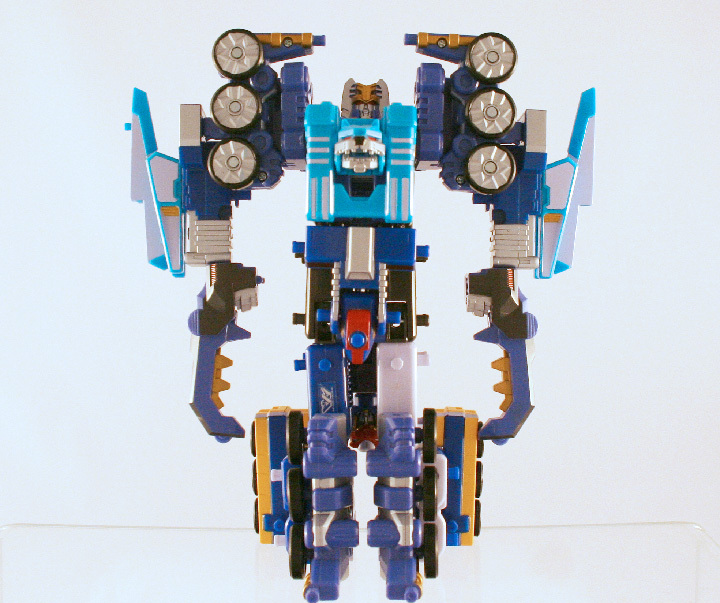 I had passed him over a lot since I was not keen on his robot mode. After seeing some combinations with him, I decided he would be a benefit to my collection. 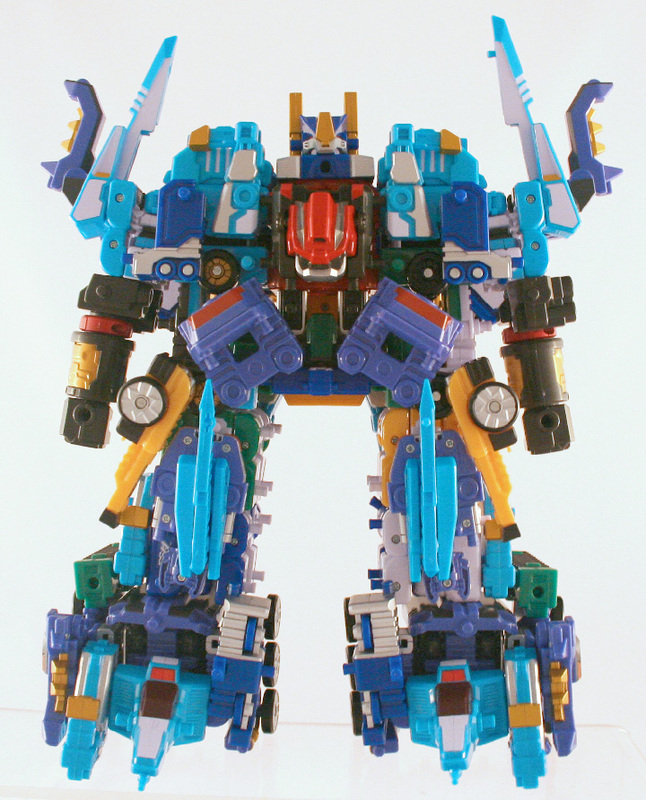 The other plus is this bot has a huge core block instead of a small robot. I figured it would be a good solution for filling torso space to build round. About the same time I found a couple of TurboRoids for $1. 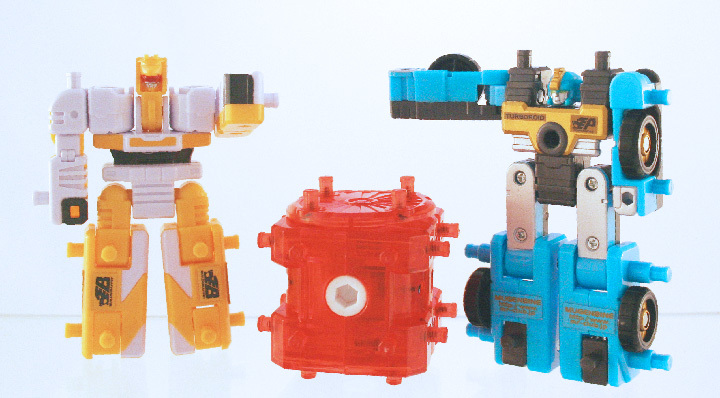 Turboroids are like the mugenroids, which are core robots to MRM sets. These were missing all the pieces, so I figured they would make decent core robots. They do not. They are not great for building, but I was able to make use of them with some creative combining. 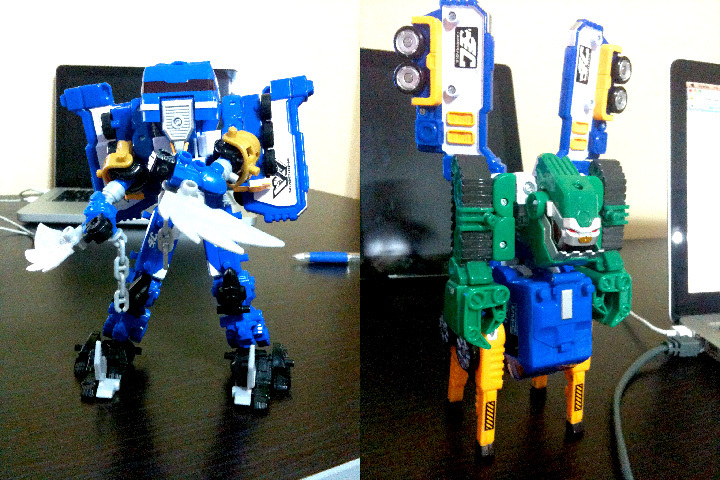 Robot Mode, no vehicles for him. (Left) Mugenroid, which turns into the core of the Mugenbine sets. (Center) Mugen Engine, which is the core of Guard Kong. (Right) Turboroid. This is what Turboroids do best, make vehicles. 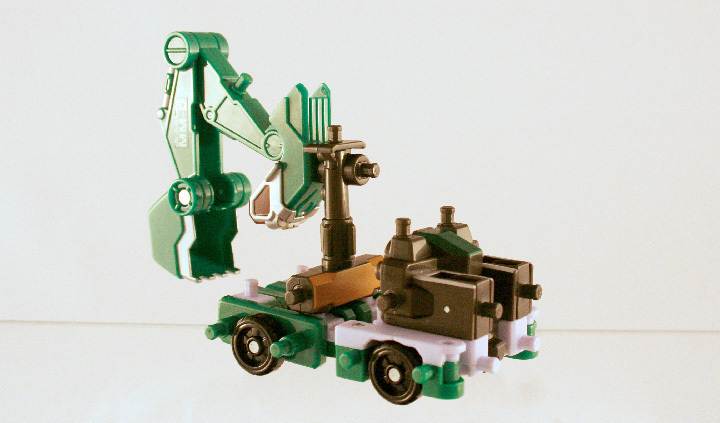 With some spare parts I was able to make some sort of truck thing. 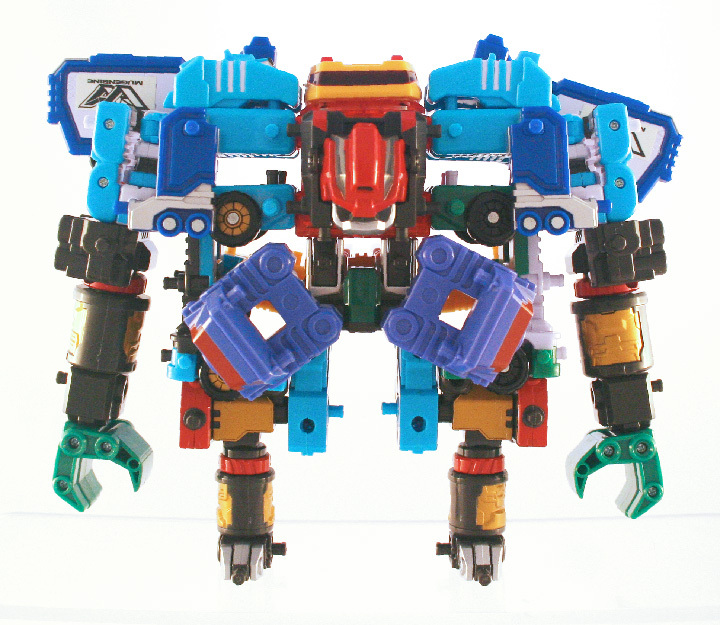 Guard Kong's limbs can quickly build up any Mugenbot. Finally I was able to take all I had collected and start building something cool. While doing this, I learned another appeal of Mugenbine, which is also their flaw. It is literally a giant 3d puzzle to build something.While they were meant to combine they are still somewhat limited. There are many male pegs on the mugenroids, but only two useable female ports. This makes make things like limbs somewhat tricky. This also leads you to have to think about how to work around their fault to make a cool robot. In the following two pieces I was able to devise a work around for parts to build these bots. I used a total of nine MRM sets and two turboroids to build my final creation. Super Gobot tribute. 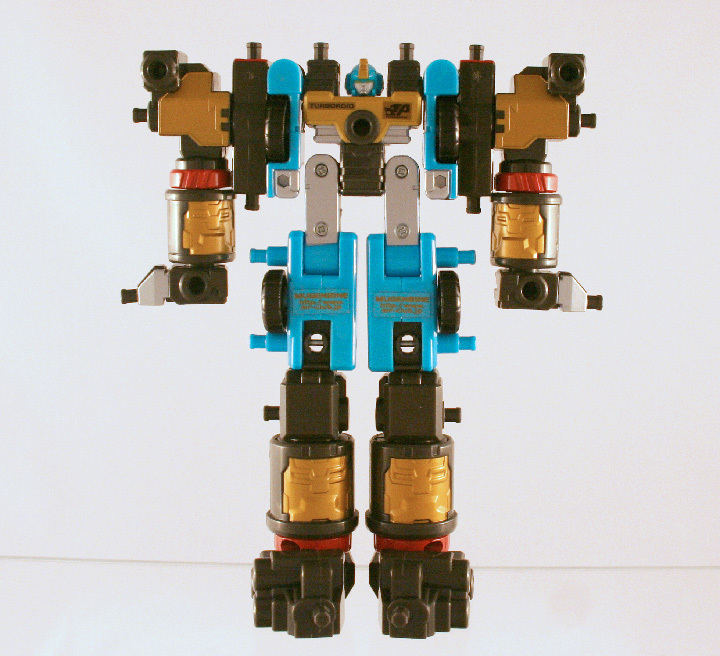 While trying to figure out how to make legs for this bot, I decided to use my imagineation and make something a little more in honor of MRM's Gobot roots. Gobots were not supposed to be autonomous like Transformers, but piloted. That is why many had windows in place of heads. My ultimate MRM creation so far. Chaos Rhino. I used every MRM piece I had except for a few pieces that only came in singles and would had made the design awkward. You can get an idea of how this all pieces together by looking at the back, though I tried to hide some of that with the extra pieces. He is about 13" tall. MRM leaves a lot up to the imagination. Not only in the final visual piece but in the approach of building them as well. These are a good tool for exercising creation with tools that are limited in their function. Also since concept artists often rely on the silhouette of a character to form a design, these provide a means to sculpt interesting form that might inspire robotic designs. Plus, they are fun. I got these also to share with my daughter as a creative tool and toy. If your interested in these, you might get lucky to find them around. At the very least you can search google images for Mugenbine combinations and see some of the clever and awesome creations made by others. Bandai also released a book you can still get from Japan of creative combinations. Do you still have any links that are selling I'm looking everywhere for these? They are on ebay. If you search mugenbine there are sets sold as New Old Stock. They are getting harder to find. Good luck.